Equestrian Canada is pleased to announce nominations for the 2019 Para-Dressage Recognition Year-End Awards. 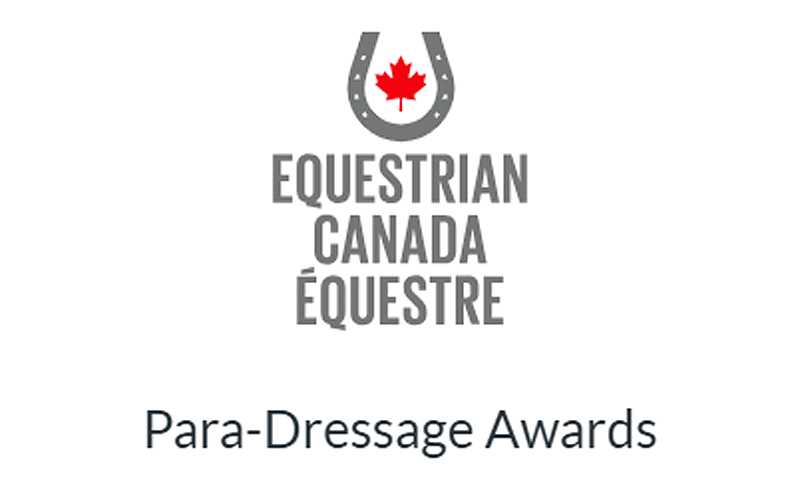 Equestrian Canada (EC) is pleased to announce nominations for the 2019 Para-Dressage Recognition Year-End Awards are now open and will be accepted until Feb. 1, 2019. The Para-Dressage Recognition Year-End Awards launched in 2018 and are presented annually to honour the achievements of our developing and high performance athletes, their coaches and horses, as well as our generous and committed horse owners and volunteers. Nominations are quick and easy through the Para-Dressage Recognition Year-End Awards Online Portal. Visit the portal by the deadline of Feb. 1, 2019 to help provide greater visibility and encourage participation of para-dressage athletes, coaches and owners. Please note: New for 2019, only award nominators are required to hold a current EC Sport Licence. This requirement does not apply to award nomination supporters. Full information on the Para-Dressage Awards can be found at www.equestrian.ca/sport/para-dressage/awards.